after the update to 4.5 academic p3d4 shuts down when loading the crj . no other ac doing this. @wildeboer not sharing to much informations are you? Nevertheless, the CRJ works at my end (v4.5) like it was working in the prior version (v4.4). So the Q arises: How did you update v4.4? (It was a complete and clean install on my PC). I only update the client. the other AC , mjc,ifly ,carenado ,virtualcol and alabeo working fine. the only external update i needed was Hifi AS weather. any error in the Windows Eventviewer? You need to update the content as well for use with PBR-enabled aircraft. However, this doesn't go for the CRJ, so Mopperle's idea to look into the event viewer is probably best. this it what the eventvwr says, for me it is acadabra. but i think there are 2 solutions installing the update total and not only the client or reinstall the crj. the last option is less work. can you after reading the above error message me the best advice?? 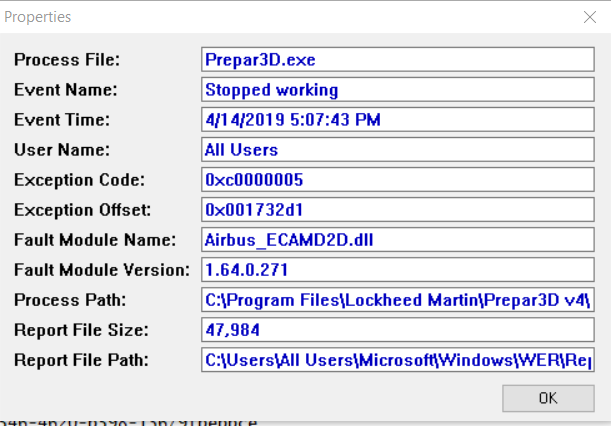 What you really need to use is a freeware app called AppCrashView, then double click on the last P3D crash in the list of crashes and take a screen shot of the data it shows and post that screen shot here. It's a lot less data than the full report and it typically provides, and that is typically all we need to look at. Below is an example of the shorter report (from double clicking on the report in AppCrashView). Your report is showing the crash was caused by KERNELBASE.dll . • Updating or reinstalling their video card drivers. • Scanning your system for corrupt/missing files. •Disable startup programs by typing msconfig in the Windows search box. When open, look at the Startup tab and disable all startups (they are all not needed for operation of your computer). • User Profile Corrupted – last resort, fix possible corrupted user profile. Other things that can cause this is CPU or GPU Overclock, non-P3Dv4 Scenery, or errant entries in your add-on.cfg file. The good news is that is not related in any way to the Airbus software. Yesterday I re-install the crj bud it didn't solve the problem . This morning I remembered that I had the same issue in februari when i changed from monthly p3d4 to academic. Because i did the same just/only changing the client. Backing Up the p3d4 cfg file and start p3d4 up to make a new cfg. And yes the crj is back without closing the p3d4 sim.